Opened in 1962 on 15 January, the Bahai Temple is the only one of its kind in Africa located 6km from the Kampala city center a long Gayaza road on Kikaya Hill 6km from Kampala on Gayaza Road. This the place of worship for the Bahai whose faith was founded in the 1800's by Bahaullah who was born in Tehran. Kabaka (King) Mutesa of Buganda relocated his palace ( kibuga ) to Nabulagala hill which was temporarily the capital of his father Kabaka Suuna II 30 years earlier which he later called Kasubi Hill a name he acquired from his birthplace located about 50 km east of this hill. 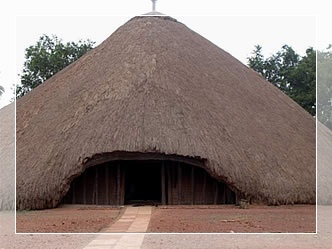 This is where he died after a long illness and was converted in to a tomb for the royals of Buganda. 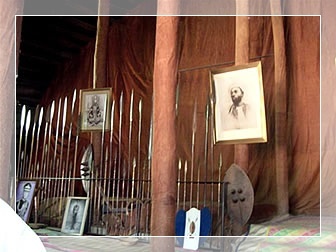 Located 12km from Kampala city center on Jinja Road, Namugongo, was the place of execution by the Kings of Buganda in the pre-colonial era. Today this place is remembered more for the execution by burning to death of the Uganda christian martyrs in on the 3rd of June in 1886. On this day thousands of piligrims from around the world throng this place in rememberance of these young men who held on to their faith in the face of death.